This was the event to pay tribute to the work of F4E staff, acknowledge the contribution of various companies and laboratories that we have been collaborating with, and finally, thank our stakeholders for their support. 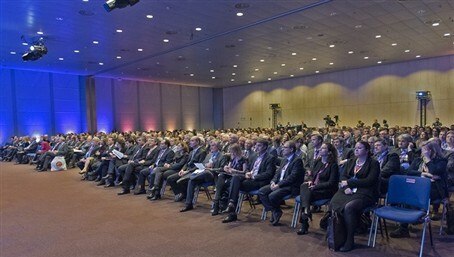 Under the same roof, more than 500 people gathered to celebrate Europe’s involvement in ITER and F4E’s role in making this a reality. A clip summarising the technical achievements in different factories and facilities (scroll down for the video) offered a smooth transition to the business aspect of ITER. Under the skillful moderation of Valerie Jamieson, New Scientist’s Editorial Content Director, who warmed up the audience by reminding us all of the value of big science projects acting as wheels of change, she invited on stage François Darchis, Senior Vice-President of Air Liquide; Thörsten Lower, Chief of Development, Equipment and Technology of Probeam; Rafael Triviño, General Manager of ENSA, and Sibylle Günter, Scientific Director of Max Planck Institute for Plasma Physics. The participants explained how Europe’s participation in ITER offered them the possibility to demonstrate their know-how and improve it, grow and tap on new markets and above all, collaborate. The event closed with an emotional 10 year anniversary clip which gathered wishes from all over the world from ITER Parties, stakeholders and big science projects. A big puzzle made out of the faces of many of our members of staff was the final image. (scroll down to see the video). The F4E anniversary concluded with a cocktail, where guests were invited to visit an exhibition with the history of the site, the progress of the various components and the contribution of our industrial partners. We would like to thank all guests for honorouning F4E with their presence and all members of staff for making our 10-year anniversary a night to remember!